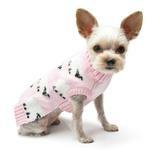 The Sheep Dog Sweater by Dogo - Pink is a cute and warm sweater that any pup can enjoy! The adorable Sheep Dog Sweater by Dogo - Pink will have heads turning whether at a sleepover or on a walk! The leash hole on the back makes easy leash attachment/detachment. The knit material will keep your pup warm and the sheep design will keep the attention on them! Sheep Dog Sweater by Dogo - Pink Customer Photos - Send us your photo! Jordie even shows her toy sheep how cute she looks in this sweater. Jordie is a sweater girl and loves wearing her new sheep sweater during winter weather. Posted On 01/23/19 by Lynda J Welter from Sacrameto, CA Yes, Lynda J Welter recommends this product! I believe this item will be returned since I am told via MeiMei's "Mom" that the XXL is much too large. Otherwise, I was told that this sweater is very, very cute. Posted On 01/16/19 by Lynda J Welter from Sacrameto, CA Yes, Lynda J Welter recommends this product! Posted On 01/25/18 by Susan G from West Lawn, PA Yes, Susan G recommends this product! My bichipoo is staying snuggly warm in this cute sweater. She is wearing it now and it kept her warm on this cold wintry day after our walk. I saw BaxterBoo mentioned on the Spoiled Maltese forums. So, I felt comfortable shopping there. I was very pleased with the large selection! I will definitely be back!